In today’s environment, there are many chemicals in our water supply that people shouldn’t drink. Most people are aware of these problems, so they drink bottled water to avoid the problem. However, bottled water is often no different than tap water and can make our fresh water supply more limited. Bottled water creates serious problems for the environment. Only 1 out of 5 bottles are recycled, creating over 3 billion pounds of discarded plastic waste. Ironically, most of this is dumped back into our water, making the tap water we drink even worse. When people buy bottled water, they are usually just buying bottled tap water. 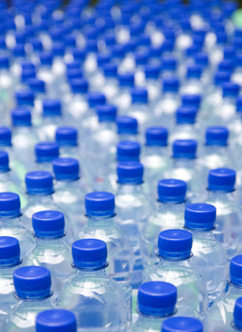 40% of bottled water is simply tap water in a bottle with a fancy label. Most bottled water is taken from the source of your tap water and filtered. You are paying 1000% of the cost for the same product! Bottled water can often be less safe than tap water. Bottled water is not required to test for e.coli, provide the source of the water, or even provide a test for quality of health. All tap water resources are required to do so and can’t distribute water unless they pass these tests. To solve the problems of tap water while reducing harm to the environment, install a whole house water filtration system. These filters prevent cancer-causing chemicals from entering you water supply, while causing no damage to the environment. You will save money while enjoying chemical-free showers and great-tasting drinking water. PuriTeam is owned and operated by Maria Williams, mom of 2 and advocate of healthier drinking water for all families. She offers free water analyses and free consultation on her site. Visit today and improve the quality of life in your home. I wish all states had mandatory recycling programs for bottles and cans. It doesn't completely eliminate the problem, but it helps. Michigan saw an unbelievable turnaround when they began their program, and I'll be honest. That recycling program is the only thing that kept me doing it. I wanted my deposits back.